Vegetable rava upma is a favorite South Indian breakfast. They relish it with a good cup of coffee in the morning. When you add various vegetables to this dish as given in the recipe below, it gets packed with wholesome goodness. 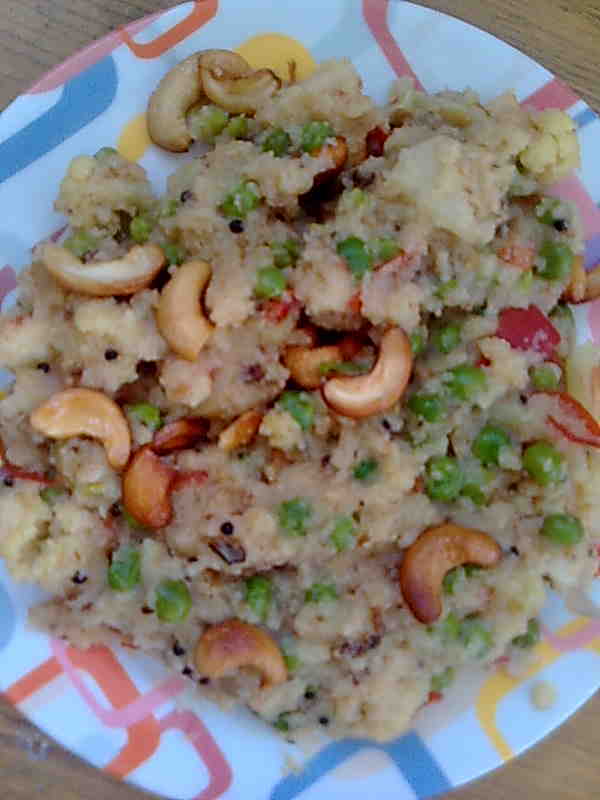 Rava upma is a nutritious and low fat breakfast and you can also have it as a snack. I usually roast 1 packet of sooji and store it in an airtight container in my refrigerator. 1. Heat 2 tsp oil in a pan and add rava. Roast till nice aroma comes out and you can see some golden grains. Turn off the heat and take rava immediately out of the pan otherwise it will keep on roasting. 2. In the same pan, heat 1 tbsp oil and add mustard seeds. When they crackle, add chana dal. After few seconds, add urad dal and cashew pieces. Roast till light brown. 3. Add curry leaves, onion and green chillies. Sauté for a few seconds. Add potato, peas and chopped vegetables. Add water and salt. Cook covered till vegetables are tender. 4. Add rava slowly,a little amount at a time, stirring all the time with other handotherwise you will end up getting thick lumps. 5. Cook covered for 2-3 minutes on low heat. 6. Turn off the heat and let it stand for 3-4 minutes. Serve vegetable rava upma hot.